Cayenne Pepper Weight Loss: Is It Really Possible ? Effortless Cayenne Pepper Weight Loss: Is It Really Possible? How Capsaicin acts on your energy production ? Cayenne pepper is more than a spice. As suggested by ancient healing traditions of different continents, it can also be used as medicine. We can easily assess some of its properties right away. When you eat it, it suddenly warms you up and can unblock your sinuses. If the dose is enough, it will make your nose and tears run. It is therefore a powerful agent but how much can it actually do for your weight? Cayenne, a type of red pepper, is classified as a natural herb used in various cuisines around the world. Nowadays it has become a universal condiment for countless dishes. It has a thermogenic effect that’s easy to notice – it heats up the body from the inside, boosting its energy production mechanism. Due to this observation, cayenne pepper became the subject of many studies aiming to prove whether it has an effect on fat burning or not. Its most precious compound is called capsaicin and it is known to alter the metabolism. The success of one’s cayenne pepper weight loss effort thus depends on the quantity of capsaicin – which is why you will find many slimming products based on this compound. Most foods do one simple thing when eaten: they provide our bodies with calories, this is a positive action. When there is too much of this positive energy balance, as scientists call it, people begin to put on weight, as they have a calorie surplus. 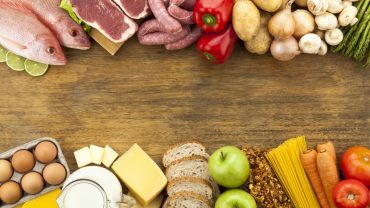 However, there are certain foods that contain non-caloric bioactive compounds, which influence this energy balance, going as far as promoting a negative balance. This is a different approach compared to calorie restriction and for this reason many people are attracted to it. Cayenne pepper is one of the foods with such substances and it has certainly gotten the attention of the scientific community, as well as that of the public. Having peppers with your meals is a good idea and is sure to have some positive effects, but it’s better to take it in supplement form if you wish to experience a real boost and power up your weight loss. 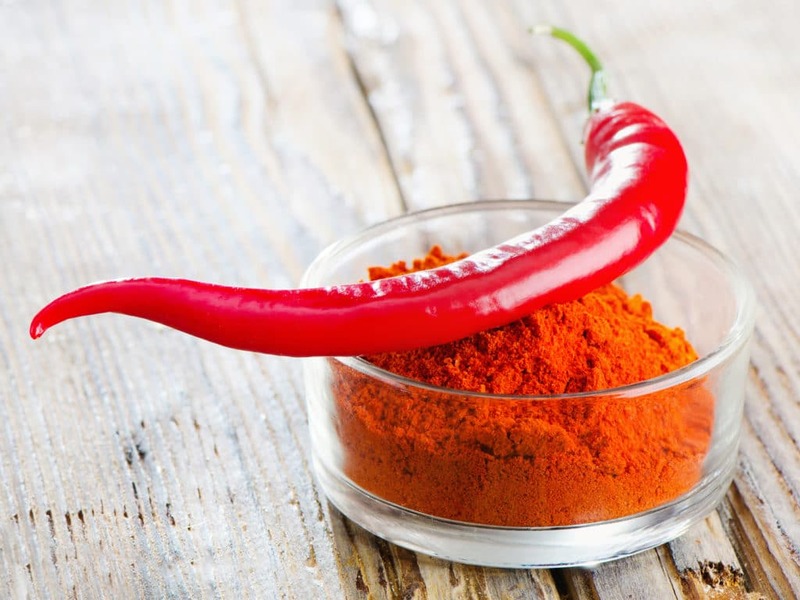 Cravings reduction – cayenne pepper increases the sensation of fullness in the stomach if taken regularly and successfully suppresses the appetite. People have experiences a significant decrease in appetite and fewer cravings, thus ingesting fewer calories than before. A 2014 study has confirmed this. Metabolic increase – a 2003 study showed that the simple consumption of cayenne pepper can increase the metabolic rate in women for 30 minutes. This means speeding up the metabolism and helping the body burn calories faster, converting these into energy. Along with capsaicin, also dihydrocapsiate can boost the metabolism, as proven by a 2010 study. Calorie burn through a thermogenic effect – as this spice raises the temperature of the body, this helps in turn burn more calories. It’s an effect that is separate from the metabolism. 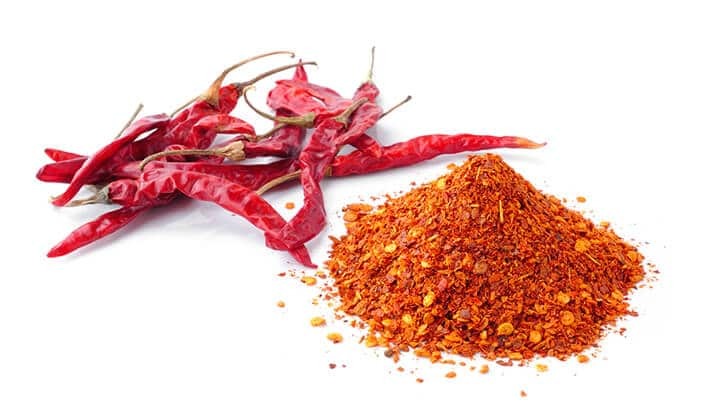 Anti-inflammatory effect – according to recent studies, both healthy individuals as well as patients with gastrointestinal complaints benefit of cayenne pepper supplementation. Various conditions of the digestive tract can thus be eased, since capsaicin has a protective role and prevent inflammation (don’t be misguided by its ‘inflaming’ action). In rats, it has inhibited ulcers. Cardiovascular protection – the risk of developing high blood pressure and having a stroke is decreased. Hunger reduction – it diminishes hunger due to its pungent taste and to its appetite suppressing compounds. When paired with green and black tea, the effect is stronger. The ‘warm blooded’ human body has a complex mechanism to produce its own heat, this comes from the nutrients ingested as well as from those stored as fat, in its adipose tissue. There are natural and synthetic compounds that can act on this mechanism and influence it. Usually, it’s a series of hormones that determine the efficiency of our fat burning process and keep the energy mechanism balanced. Substances like capsaicin from peppers can further influence this. Its action was subject to various scientific studies. The Capsaicin molecule is exactly that which causes the burning sensation and y that alone you can judge its power. It was revealed to activate specific receptors in the gut, have a thermogenic effect and lower the appetite, regardless of how it’s taken – in fresh or supplement form. Capsaicin increases the body’s internal energy expenditure and promotes the oxidation of fat. The higher the dose, the more successful it becomes. A similar compound called capsiate, also found in cayenne peppers, was found to act the same way. According to the researchers’ conclusions, the outcome is modest but certainly not a myth. It can thus be an aid in weight reduction but not a method per se. 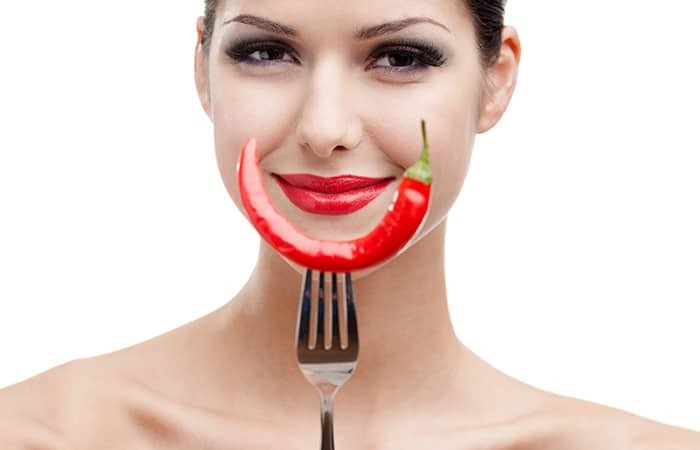 Cayenne peppers have an immediate effect when it comes to appetite suppression. They act quickly and, when consumed with a meal, they prevent one from overeating. The taste as well as the key nutrients promote quick satiety. You will not only eat less, but also feel hunger later than usual. If your body responds well to capsaicin, then it can reduce your desire for snacks between meals and keep you satisfied until your next meal. It’s a good method top try when you are aiming for portion control and dealing with frequent, unyielding hunger. No matter how you decide to consume these, the many effects of peppers and their potent extracts will be noticed soon. Apart from the hunger suppressing properties, you will experience increased heat and vitality. Your body starts to use with up to 20% more energy while oxidation is also increased, which means you can burn more fat to produce that energy. These effects last for about two hours after pepper consumption, however, because the quantity of active ingredients is small. To accomplish more, you should try the high-concentration supplements. Apart from the enumerated actions, it is a well known fact that the spiciness has an immediate effect on skin and soft tissue. If the area is sensible, it becomes red and swollen. This is because the active compounds stimulate the blood circulation. How is this important to weight loss? When the blood flow is improved, the body can make better use of nutrients. Fat cells can be dislocated and used to produce energy. The stimulation allows us to become more active and to start exercising. Of course, miracles won’t happen on their own when it comes to losing weight. You need to take advantage of the changes and take further action. You may see a substance like this as a helping hand or a trigger which enables you to start losing weight successfully. Besides, it represents a very cheap way to give yourself a boost – instead of using expensive supplements that do the same (and perhaps with the use of harmful ingredients). Whether you want to use for fat burning or for your general health, it is important to become aware of the main guidelines. First of all your cayenne pepper weight loss efforts will have maximum results if you aim for a concentrated supplement and you take it regularly. Still, you can benefit from simple pepper consumption, as proven by research. You may cook with pepper in its raw form or purchase it dry, as flakes or powder. Mexican and Indian cuisine both use it in abundance. The powder may be added to coffee, hot chocolate, smoothies, protein shakes etc. Aim for the following daily quantities: 1 gram if it’s dry and 28 grams for the fresh type. If you’re not a fan of spicy meals or don’t like the taste for some reason, opt for capsules. Such supplements may have up to 120 milligrams of active ingredient per dose. You can also find tincture, which is still very concentrated but needs to be added to beverages, therefore you will feel the taste. Take pepper in small doses at first, if you’re unsure about your body’s reaction. It may feel like it has a strong inflaming reaction. The eyes, nose, lips and mouth lining can become irritated. If you fear such reaction, then choose to supplement with capsules. Inside the stomach, which contains its own very strong acids, capsaicin won’t cause that much trouble. Cayenne pepper should not be taken for a long time, as researchers suspect that the body can get accustomed to its effects and stop responding so well. The best metabolic increase was seen in people who were not adjusted to eating spicy food. The supplements gave them a solid boost, which lasted until they built up tolerance. Cayenne is only part of your weight loss routine. Use plenty of herbs and spices on a daily basis, get suitable supplements and slimming pills, drink enough water, make healthier food choices and start exercising vigorously. Other herbs with similar effect are cilantro, cinnamon, dandelion, black pepper, ginseng, parsley, rosemary, cumin and peppermint. Cayenne pepper is safe and natural, in both fresh form and extract. It’s been employed for thousands of years as spice for food and beverages but also as medication. It may not be everyone’s cup of tea in terms of flavor but it’s worth the attention if you’re having trouble losing weight. Let’s talk now about the side effects it may have. We already mentioned that cayenne pepper may cause a burning sensation in your mouth, as well as affect your eyes and nose. Apart from that, it may be unsafe if you’re taking certain medications, such as pills against high blood pressure, against blood clotting or theophylline in any form. It even interferes with common ones like aspirin and antacids, which means you must be careful about it. Pregnant and breastfeeding women should also stay away from it. Supplementation should start slowly, with small amounts, and the dose must be increased gradually. Otherwise, it may generate symptoms like irritation or heartburn. Cayenne pepper may trigger allergic reactions in sensitive people. It’s been noticed that individuals allergic to latex, avocado or bananas for example will also manifest similar symptoms with capsaicin consumption. Hot peppers are a great addition to your diet if you’re planning to shed pounds. Their effect on one’s metabolic and fat burning rate is already proven. However, supplementation is not enough to trigger significant weight loss on its own. Still, it can be an important aid when you are committed to a complete weight loss regimen, which includes a helpful diet, regular exercise and smart supplementation with natural products. Unlike other supplements, cayenne pepper won’t jeopardize your hormone production and won’t create any dangerous disturbances in your body. If you want a more serious boost through natural substances, then try a complex supplement or weight loss pill containing this extract. Many formulations include high quality capsaicin derived from organic sources, along with many other compounds with similar or connected effects. Thus, you can cater to more aspects that lead to weight loss. For at least a few hours, you’ll be enjoying the benefits of what is known as a fast metabolism, which is particularly helpful and exciting if you’re one who complains of a low metabolic rate. Also, you may want to use pepper along with different other spices, which tend to act the same way, for more powerful consequences. This will not only add variety, but will have a greater potency when used together. With cayenne alone, you should not expect any drastic or spectacular weight loss – it can only boost your other slimming efforts. Try it out and see how it goes for you – in regards to how you hungry you’re feeling and how much food you’re needing.